To connect B2 to loudspeakers you will need speaker leads with 4mm plugs to plug into the B2. We sell 3 metre leads but you can buy or make your own. 4mm plugs are often called banana plugs. The loudspeaker connectors on the B2 are spaced 10mm apart so don’t buy plugs that are wider/fatter than that. Loudspeakers should ideally be eight ohms but B2 is OK down to four ohms if you keep the volume below the max. The loudspeakers should be rated to handle at least 15 watts RMS continuously. Our BSP50 loudspeakers are rated at 50 watts. The power amplifier is a bridge amplifier - red and black outputs are both driven - so you cannot connect the two black terminals together and you cannot use the loudspeaker outputs as an input to another amplifier. The power amplifier is short circuit and thermally protected - if it does shut down just press stop - remove the fault or let it cool and press play again. You can plug headphones with a small 3.5mm jack into the combined spdif/line out connector. The headphone volume is adjusted by the knob on the front. Plugging in the headphone will normally disable the loudspeakers (but see the section on Jack Sense below). The line out connector has shared uses so it doesn’t have a dedicated headphone amplifier or a true line level output for that matter. If you need audiophile quality or have “difficult” headphones then I suggest using an optically coupled headphone amp like this. The best way to connect to an amplifier is optically - but you need an amplifier with an optical input. There are two advantages to optical. 1) The digital “signal” delivered to the amp is exactly what left the Brennan. 2) The equipment is electrically isolated so there is less likelihood of ground loops and other kinds of interference upsetting the amp. Conversely a traditional analogue electrical connection suffers from - attenuation, frequency response, cross talk, interference and ground loops - but may be adequate especially for short hops. The optical cable should have a Toslink connector at one end (for you amp) and a 3.5mm plug on the other like this. Brennan B2 uses a 3.5mm stereo jack and your amplifier probably has twin phono (or RCA) sockets so you will need a cable like the one on the left to connect them. Important - because of the shared use of the output you need to turn up the volume almost on the B2 to max - say level 60 - and leave it there. Use the volume control on the final amplifier to get the right listening volume. Some audio equipment may need a higher signal level up to 3.4V pk-pk or a lower impedance say 600 ohms. I recommend using an inexpensive external optical DAC for this. Some owners ask about sharing or switching the B2 output between different amplifiers. The simplest way may be to use a phono splitter (search for “phono splitter” or “rca splitter”). That will be prone to the interference issues I mentioned above but may be adequate for your needs. I recently discovered an optical splitter (search for “optical splitter”) that should allow you to drive several amplifiers without any degradation and without any interference - although you will need amplifiers with optical inputs or external optical DACs. The normal behaviour of the B2 is to disable the loudspeakers/power amplifier if something is plugged into the SPDIF/Line out. It doesn’t matter whether it's optical or electrical. B2 can optionally send the sound to the HDMI output. This is a digital signal so has many of the advantages of optical. You can hear the sound on an attached TV and HDMI is being used increasingly by audio equipment. You must enable the HDMI output using the settings panel - the cog icon - on the web UI. 4 ohm 10 watt speakers? B2 will drive these OK but keep the volume below max. The B2 has overload protection. If it ever overloads and goes silent just press stop and start again a bit quieter. B2 is capable of destroying 10 watt loudspeakers so keep the volume down. Yes - it takes headphones with a small (3.5mm) jack. Plug them into the Line Out at the back - that will mute the main speakers. The B2 line out is a hybrid connector that has an electrical analogue signal for driving headphones and other audio equipment plus an optical digital signal for driving amplifiers with optical inputs (or high end DACs again with optical inpts). Optical and electrical signals don't interfere so they are both output at the same time. You will need a special optical cable - you can buy from us - if you want to use the optical signal. If you are having problems make sure the volume is turned up and check the line output with some headphones or earphones. No problem the B2 amplifier is happy to be left unconnected indefinitely. Does B2 have Analogue Line Out? Yes - B2 has analogue line out. Because B2 is so small there isn't a lot of room for connectors so we used a special combo connector for SPDIF/Line Out. You can plug in a standard 3.5mm stereo jack for analogue or plug in our optical cable that has a standard Toslink connector on the other end for digital. Optical is not susceptible to ground noise so is better - if you have kit that has it. Can I buy my own speakers for the B2? Yes B2 works with most speakers. B2 was designed for 8 ohm loudspeakers - like our BSP50s. The BSP50s are matched to the power and physical size of the B2. If you are looking for higher quality loudspeakers then you need to think about spending more than £200. Will it sound the same as playing the CD? Yes - on B2 CDs are normally compressed to FLAC and FLAC files are reconstituted to exactly the same samples - so it will sound the same as the original CD - because it is the same. Can I use B2 with my wireless Sonos Speakers? Yes - click the NAS & Sonos tab at the top left. Its not a true line out - this output doubles up as headphone output so the level changes with the volume control - unlike a classical line out. The level goes up to about 1V pk-pk or 350mV RMS. You can buy a speaker switch that will switch your speakers between B2 and your Radio I found one on Amazon - search for "speaker switch". Q: I have 10 speakers in my workshop where I was hoping to use the b2 at the moment they are driven by three amps. I was intending to integrate the b2 by connecting via the 3.5 mm line out to TVs phono leads. The Brennan is producing a poor quality sound and also the output is controlled with the b2's volume button. I'm sure this apart from the poor sound quality is not good for the b2 's amp. Do I need to buy a separate dac and connect my system with that or is there a cheaper solution? I just tested this inexpensive DAC with optical input - £12.99 from Amazon. This DAC will produce a signal that does not go up and down with the B2 volume control. It may also have a lower impedance which may help with your setup. The optical coupling will help combat any ground loops. You will need to buy the optical cable from us or equivalent elsewhere. In general there are two ways to connect B2 to a Hifi Amp. 1) Electrically using a copper cable. This sends an analogue signal and is ok but is prone to interfence and ground loops. 2) Optically using an optical fibre. This sends digital values so there is no noise or distortion and no ground loops - but you need an amplifier with a optical input or an audio DAC (usually they have optical inputs). If you connect optically you need one of these which you can buy from our shop page or search for "toslink to 3.5mm cable"
There are two ways you could wire the speakers. 1) In series - this will reduce the amount of power you get 2) In parallel - technically this overloads the amplifier and it will shut down - but only if you play at high volumes - its not serious just press stop and let it cool for a second or two. I did a sketch of what I mean by series and parallel - hope that makes sense. If you order some speaker leads from us that will allow you to just plug things together so you get a good connection that you can quickly attach and detach. Two Volume Controls - Whats Right? When connected through an amplifier there are two volume controls that work in tandem. The best stetting is to turn up the volume on the B2 as high as you can without getting distortion on the loudest passages - then drop it down one or two and leave it at that setting. Use the volume control on the amp thereafter. Does B2 work Wireless Speakers? Not in general - only Sonos. You can easily make them yourself. Buy some 4mm plugs (also known as banana pugs) on Amazon and some inexpensive speaker flex from a DIY store. Don't go for expensive plugs - thay are no better and may be too bulky. The DAC we use has 64 steps. This AV receiver has optical so buy an SPDIF cable from us or elsewhere. 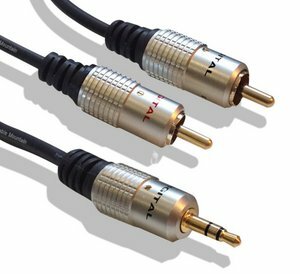 For amplifiers without optical you generally need a 3.5mm to RCA (aka Phono) lead. Like this from Amazon. The B2 line out is not a dedicated headphone amplifier but has shared use. If you encounter poor quality with your headphones and/or want the best quality then consider using an external optical DAC and headphone amp - like this from Amazon - though you can pay a lot more for High End kit. To connect B2 to an amp with an electrical SPDIF input - I Googled "optical to coaxial converter" and got this from Amazon. B2 owner Chris D bought and recommends this digital amplifier for use with B2. I know that you can play a vinyl turntable through the B2, but will it support a moving coil cartridge, or does it require some kind of converter? Buy two leads. 1) a 3.5mm jack to phono lead 2) a 5 pin DIN to four phono sockets like this. You may have to check the amplifier manual or just experiment to get the sound to come through. You can't simply connect left and right on the line out. Search for a stereo to mono 3.5mm splitter - then connect either left or right to the subwoofer low frequencies tend to be mono. You just need to connect the top speaker terminals to the lower speaker terminals at the back of the speakers - then connect to B2. You could run two sets of speaker cables back to the B2 but its probabaly going to look unsightly having eight speaker wires at the back of B2.